The name "Andrew" (Gr., andreia, manhood, or valour), like other Greek names, appears to have been common among the Jews from the second or third century B.C. 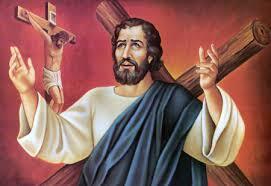 St. Andrew, the Apostle, son of Jonah, or John (Matthew 16:17; John 1:42), was born in Bethsaida of Galilee (John 1:44). He was brother of Simon (Peter) (Matthew 10:2; John 1:40). Both were fishermen (Matthew 4:18; Mark 1:16), and at the beginning of Our Lord's public life occupied the same house at Capharnaum (Mark 1:21, 29). Finally Andrew was chosen to be one of the Twelve; and in the various lists of Apostles given in the New Testament (Matthew 10:2-4); Mark 3:16-19; Luke 6:14-16; Acts 1:13) he is always numbered among the first four. The only other explicit reference to him in the Synoptists occurs in Mark 13:3, where we are told he joined with Peter, James and John in putting the question that led to Our Lord's great eschatological discourse. In addition to this scanty information, we learn from the fourth Gospel that on the occasion of the miraculous feeding of the five thousand, it was Andrew who said: "There is a boy here who has five barley loaves and two fishes: but what are these among so many?" (John 6:8-9); and when, a few days before Our Lord's death, certain Greeks asked Philip that they might see Jesus, Philip referred the matter to Andrew as to one of greater authority, and then both told Christ (John 12:20-22). Like the majority of the Twelve, Andrew is not named in the Acts except in the list of the Apostles, where the order of the first four is Peter, John, James, Andrew; nor have the Epistles or the Apocalypse any mention of him. From what we know of the Apostles generally, we can, of course, supplement somewhat these few details. As one of the Twelve, Andrew was admitted to the closest familiarity with Our Lord during His public life; he was present at the Last Supper; beheld the risen Lord; witnessed the Ascension; shared in the graces and gifts of the first Pentecost, and helped, amid threats and persecution, to establish the Faith in Palestine. When the Apostles went forth to preach to the Nations, Andrew seems to have taken an important part, but unfortunately we have no certainty as to the extent or place of his labours. Eusebius (Church History III.1), relying, apparently, upon Origen, assigns Scythia as his mission field: Andras de [eilechen] ten Skythian; while St. Gregory of Nazianzus (Oration 33) mentions Epirus; St. Jerome (Ep. ad Marcell.) Achaia; and Theodoret (on Ps. cxvi) Hellas. Probably these various accounts are correct, for Nicephorus (H.E. II:39), relying upon early writers, states that Andrew preached in Cappadocia, Galatia, and Bithynia, then in the land of the anthropophagi and the Scythian deserts, afterwards in Byzantium itself, where he appointed St. Stachys as its first bishop, and finally in Thrace, Macedonia, Thessaly, and Achaia. It is generally agreed that he was crucified by order of the Roman Governor, Aegeas or Aegeates, at Patrae in Achaia, and that he was bound, not nailed, to the cross, in order to prolong his sufferings. The cross on which he suffered is commonly held to have been the decussate cross, now known as St. Andrew's, though the evidence for this view seems to be no older than the fourteenth century. His martyrdom took place during the reign of Nero, on 30 November, A.D. 60); and both the Latin and Greek Churches keep 30 November as his feast.